Research, musings and finding inspiration. 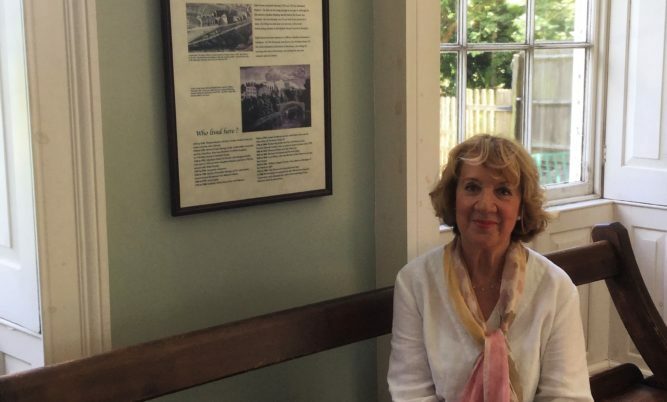 It was a glorious summer day when Helen Bowden, director of Orphans Publishing, and I stepped from the car in the centre of the Ironbridge World Heritage Site near Telford in Shropshire recently. When I made my first visit earlier this year I was wrapped up against the biting cold but now it was sweltering. 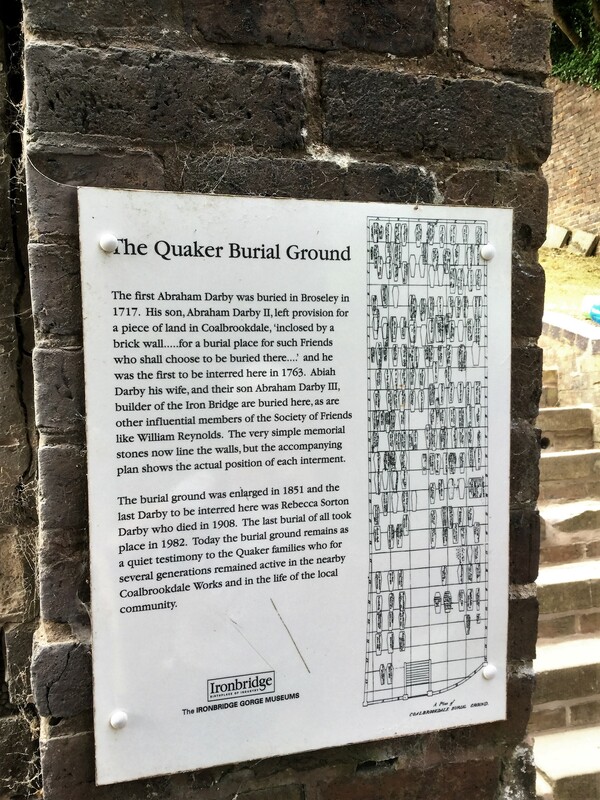 We had come to see the famous Quaker Darby Houses which are closed in winter. I have already written at length about this amazing place: “Over the Ironbridge with Elizabeth Fry!” in February so won’t repeat facts and figures here. Our first port of call was the Museum of Iron to say hello to the ever knowledgeable David Harris and his colleague Matt. 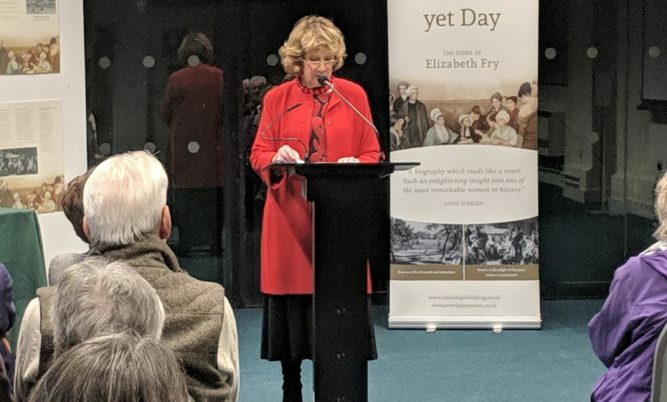 Then we climbed rather a lot of stairs up to the library where we were welcomed by Joanne Smith, Museum Registrar, and Georgina Grant, and had the pleasure of seeing our book on Elizabeth Fry, While It Is Yet Day, formally added to the library. It was during a visit to see her sister, Priscilla Gurney in Coalbrookdale in 1798, that Elizabeth Fry first heard Deborah Darby preach. 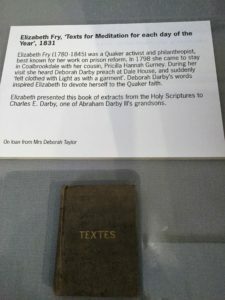 It was a pivotal moment in the young Elizabeth’s life who later wrote in her diary: “I am to be a Quaker.” This is why we so wanted to visit the Darby Houses. 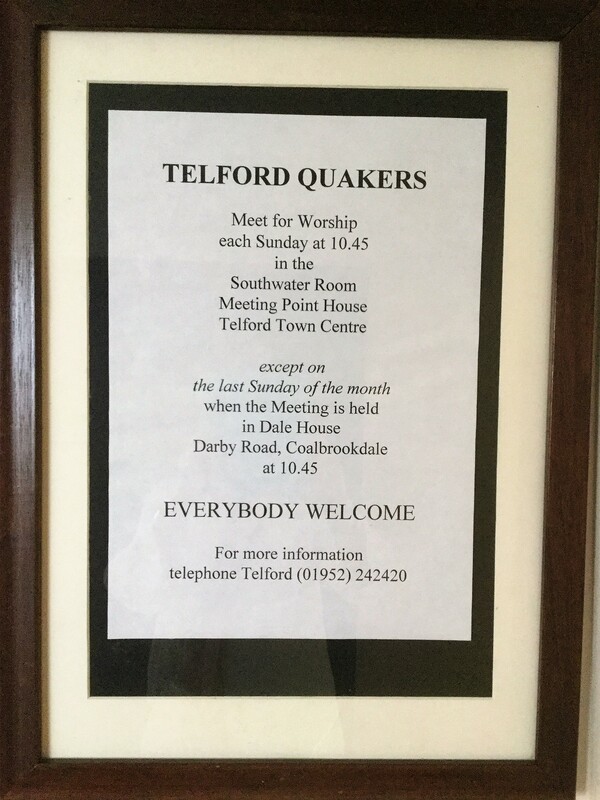 To my delight, the very room where Deborah spoke in Dale House is still used occasionally for Meetings for Worship by the Telford Quakers. 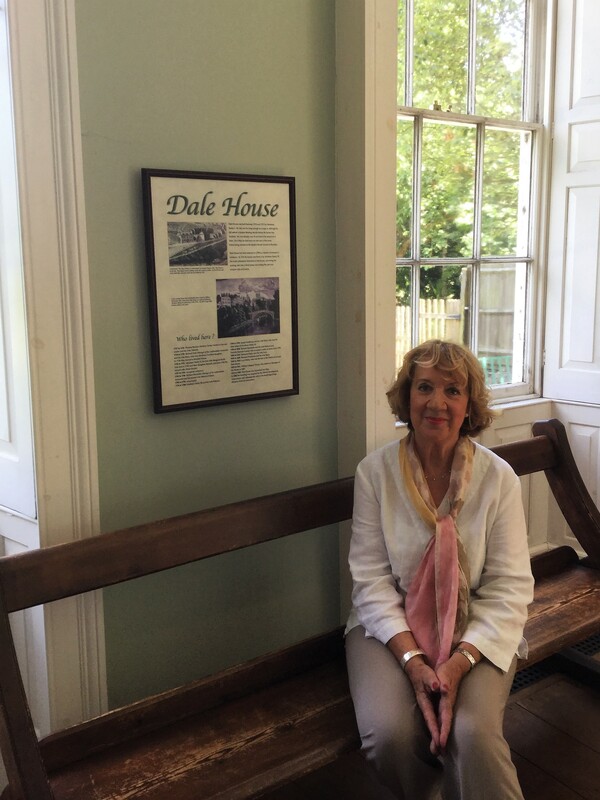 The houses, Dale House and Rosehill, have been lovingly restored with help from members of the Darby family. 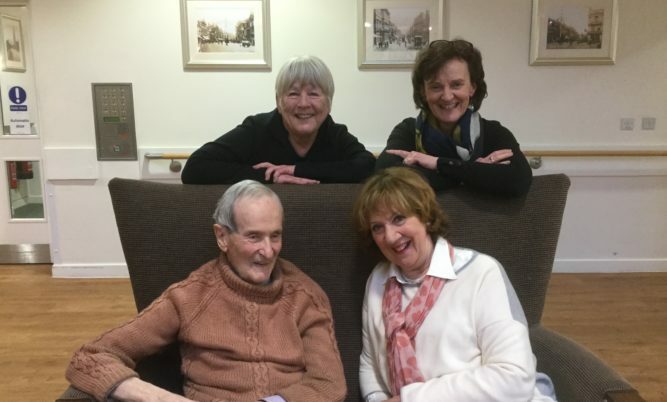 Rachel, Lady Labouchere, who died in 1996, helped the museum secure funding to buy the houses as they became available and donated over £25,000 herself. There are some lovely rooms, including a child’s bedroom, and it was possible to imagine Elizabeth and Priscilla walking there with their friends and marvelling at all the innovative iron works going on around them. I hope to learn more about Deborah, who was married to Samuel Darby. 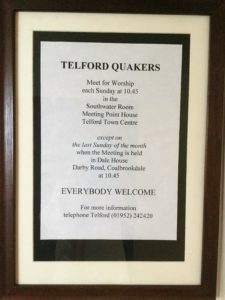 She was a formidable lady in her own right and travelled to America in the Quaker ministry. 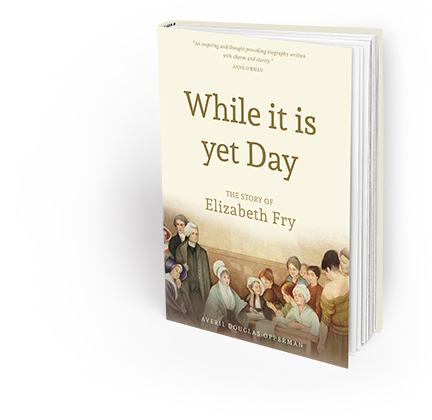 She had a profound effect on Elizabeth Fry and the two women greatly admired one another. 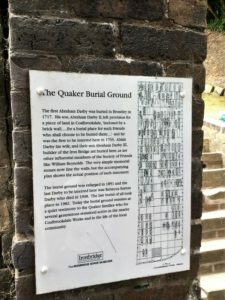 Above the Darby Houses is a Quaker Burial Ground provided by Abraham Darby II who was the first to be buried here in 1763. A tree is said to mark his grave. Renovations have just started and small memorial stones lie around the walls. 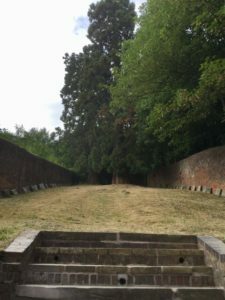 A complicated plan of graves will be studied scientifically before the work gets fully underway. Sadly the Ironbridge is still partially under wraps being painstakingly restored in a £1.2m project. But you can walk over one side and return on a lower level where there are windows showing the work being undertaken. Opposite is a delightful café, The Tea Emporium, where we had lunch followed by a wander before heading home aware that there was much yet for us to see. As they say, you should always leave a place with a reason to return!